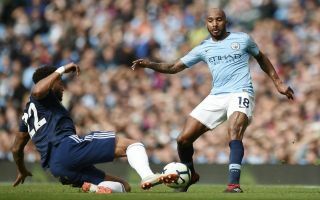 Manchester City midfielder Fabian Delph admitted that Pep Guardiola’s men have to be more ‘ruthless’ in front of goal after beating Fulham on Saturday. The Citizen’s secured their fourth win of the new Premier League campaign on Saturday, beating the newly promoted Cottagers 3-0 thanks to goals from Leroy Sane, David Silva and Raheem Sterling. However, the home side were guilty of wasting several fantastic opportunities to increase the winning margin, despite having a host of world-class attacking players on the pitch. According to Fabian Delph, who started his first game of the new season in the win at the Etihad, City must be more clinical in front of goal as they bid to challenge on all fronts for silverware in the coming months. The English stalwart told Man City’s official website post-match: “It was frustrating to not put more chances into the ball of the net – we need to be more ruthless. Guardiola’s side remain two points behind Liverpool and Chelsea after yesterday’s fixtures, with a trip to Wales to face Cardiff City on the horizon next Saturday. Before that City will kick off their 2018-19 Champions League campaign on Wednesday night against Lyon at home, where they will be expected to start with a win in Group F.
Although the champions of England haven’t managed to quite hit their stride domestically so far this term, they remain the strongest team in the country and supporters will be expecting them to come closer in Europe this season. Domestic dominance alone will not be enough to earn this City team a place in history, which means that they must start putting their chances away more frequently to ensure swift progress into the later rounds of Europe’s Premier competition.